When most people think of a gallery wall they think carefully constructed family photographs neatly arranged in matching picture frames. This does look lovely and I have the same style in my own home. However, there are many other styles which can be explored. I’m a big fan of the gallery wall and wanted to share some of my favorite designs. I love this idea as it is totally unique to your home and incredibly meaningful. It enables children to feel so proud of themselves to see their work displayed so prominently. This always creates a bright and colorful display that will make you smile every time you see it. I’ve used my children’s artwork in their bathroom. 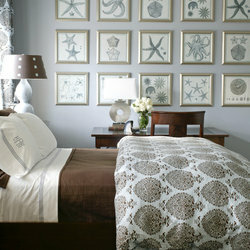 A collection or theme really pulls a scheme together and allows your collection to be seen. That rhymed! By far one of my favorite things to do as a designer. Pulling together lots of different components and making them fit yet in such a way that your eye is led on a journey, coaxing you to explore every aspect of the display. This is a very popular idea and there is an abundance of typography pictures and plaques available making this design easy to achieve. 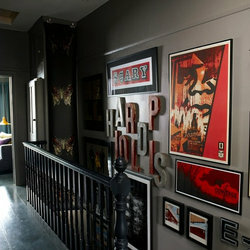 I like the look of a picture rail as it is easier to change the look than something nailed to the wall. Again this is something I have used in my children’s bedrooms to display their certificates and photographs. 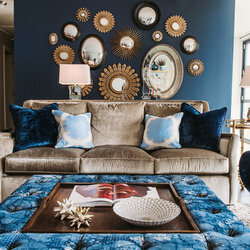 Saving the best til last this design by SuzAnn Kletzien Design makes me want to be in this room and its a total feast for my eyes. The mirrors are interesting and beautifully arranged yet also serve the purpose of brightening the dark, luxurious blue by reflecting light. I’ve also used a collection of fun postcards in my ground floor WC, it’s helped to give a tiny space much more depth and interest. 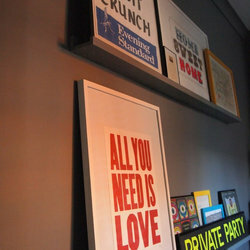 Please share your gallery wall ideas in the comments, we cant wait to hear what you come up with! More on DIY? check out some other of my blogs articles! This is going to be my next project! I just created an amazing wall. Funny thing is that I didn’t think it had a name! a similar subject, your site came up, it appears good. I have bookmarked it in my google bookmarks.